Go Green! 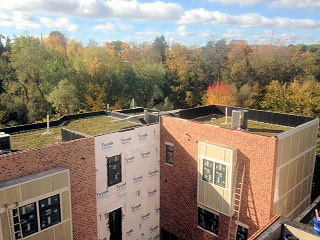 | Midtown Development, Inc.
Those are not easy words for a couple guys from UofM (Dave Whiteford and Mike Wills) but we are talking about garden roofs at Uptown, not football. 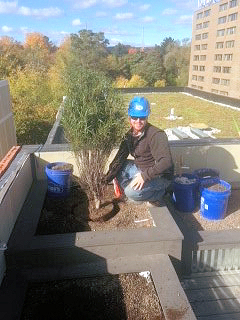 Nate Griswold and team Inhabitect are putting the finishing touches on the rooftop plantings. 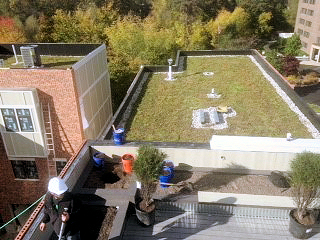 Pretty COOL (just one of the many benefits of a green roof)! This entry was posted in News, Uptown Cityside Townhomes, Uptown-Riverfront living downtown TC and tagged Boardman river condos, Cityside Townhomes, Condo developments traverse city, condos on the river, Garden Roofs, green roofs, Inhabitect, new condominiums traverse city, traverse city condominium projects, Uptown Condominiums, Uptown Garden Roofs, Uptown Traverse City. Bookmark the permalink.